Below is some advice I have on branding myself and the ins and outs I've learned while navigating through the social media world. 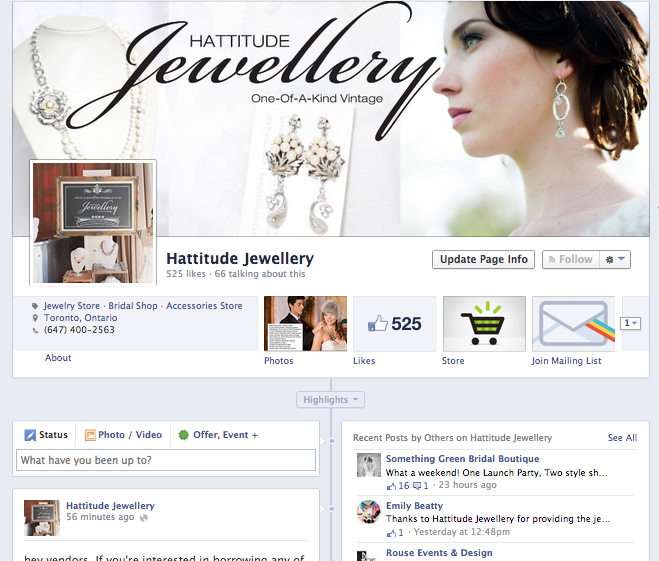 I've gotten a lot of comments about my social media, marketing and branding for my small business, Hattitude Jewellery. I take vintage items, old brooches, earrings, necklaces and other oddities and up-cycle them into new modern pieces. I have an every day collection, which can be viewed here, www.GotHattitude.com, and a bridal boutique www.hattitudejewels.etsy.com. A lot of brides love bringing me their grandmother brooches so I can re-work it into a modern necklace for them to wear on their special day. Most of my clients and customers come from word of mouth and social media. I cannot afford to do advertising so my biggest source of clients and customers is self promotion and networking. Here's some advice on how I go about my social media and marketing strategy. Disclaimer; I'm not saying this is correct or only way to use social media, this is just from my personal experience what I have found helpful and works well in attracting, engaging and keeping customers aware of your brand. Branding is a huge part of selling yourself as a business. My suggestion is get a great logo, and hire someone to do it professionally for you. Once you get a logo... it's REALLY hard to change it afterwards. I had mine made up this past year and am in LOVE with it. Thanks to Breanne Merrick of Bre- Creative. Pick three social media platforms you love and stick with them. With SO many platforms out there on the web, I find it too hard to keep up on all of them and do an effective job. The key word here is do an effective job. It's easy to use them all...but to use them all effectively is where it gets tricky. So pick three and get good at them. I have found that posting on social media three times a day consistently really helps. Anymore posting per day then that and your awesome post gets lost due to facebook guidelines. They do not viewed as often or people lose interest and block your page. Try scheduling posts with the timer on fb pages, so they are a few hours apart at least. Since every social media platform is different, these are my guidelines for posting on Facebook. There are new Facebook rules and guidelines that not everyone who likes your page sees your post, therefore you want to post three times a day on completely different items so different people who like your page are becoming engaged. For example, my first post in the morning might be a behind the scenes photo, maybe of my studio space for the day or my show room. I find people love knowing where the products are coming from. They love seeing behind the scenes shots. My second photo might be of an awesome styled shoot that I found on the web. My third post might either be a photo of myself, saying something about myself of me after a long day in the work shop. I find my customers like to see who is making their products. It puts a face to the product and collection, since I don't have a store front for them to interact with me. I have to engage them and allow them to get to know me through social media, instead of face to face since almost all my sales are done online. My third post also might be a creation I finished, or the latest piece from a collection or if I have finished a blog post it may be a blog post that I have written. Some key things about Facebook is people love visual posts. Facebook tends to let these show up more in people's news feed then just posting a status. Get to know your insights on your FB page. When are people engaging with your posts? Which ones got the most actual clicks? What time of day are your customers online? Keep this in mind when posting in the future. If you are in retail, customers statistically like when you post on Thursdays and Sundays. I get the most hits those days. When posting on FB also try to pose a question at the end of your status so people know you are talking to them and wanting to hear from them. Try to post different outlets like videos, memes, photos, information that is relevant to your customers (for example in my business, how to style jewellery, wedding stylized shoots etc) different types of media content. Try changing your facebook photo cover and profile photo. It's a great under utilized space. Share, share, share and help cross promote other vendors! They will reciprocate. Share some of their Facebook posts that you think your customers would be interested in. Tag them in your posts if you have collaborated. Everyone wins if you cross promote. Don't forget to log into your facebook as your business account and start commenting with other like minded businesses as your business. This is networking through social media. I have met SO many people, who I can now call my friends, including vendors, Courtenay and Jenny of Rouse events and design who I have worked with and been published in a magazine with and we "met" through facebook. Instagram is a different game then Facebook. I always try to make sure to put different photos on instagram then my Facebook page. This gives people a reason to follow both and they are not ALWAYS looking at the same photos on each platform. Although, yes I am guilty of sharing the odd time on both instagram AND facebook the same photo because it's just so swoon worthy I can't help it! But I always try to avoid it when I can. When I tend to get the most likes and comments and people engaged on instagram is when I post close up shots, and very artistic shots of my jewellery, maybe wrapped in lace, or laying with a prop. This is where a photography class comes in handy. My friend Sara of Sarunia photography hosts beginners photography classes (see how I cross promoted a vendor there, with content that I think my readers would be interested in hehe). My followers on insagram love getting to know me as a person and as a designer. I post selfies, cat photos, my boyfriend, my studio, my home, my family, my flowers, my jewellery. 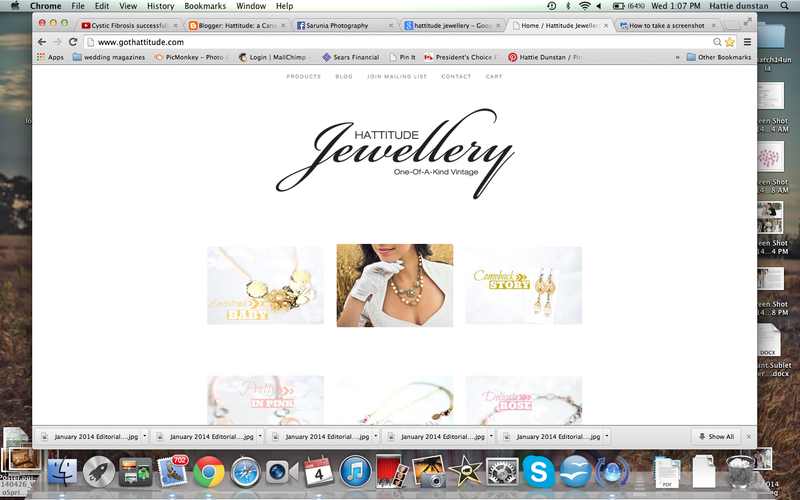 Anything that gives them a bit of a peek into my life as the jewellery designer behind Hattitude jewellery and I always try to do it with a bit of flare. This is why a beginners photography class is great as well as camera + app and Big LENs app. Both awesome at creating an SLR camera photo look, with just using your iphone camera. To be honest, I am still trying to figure this platform out. It is one of my favourite for personal use and I know that I am weak at this one from a business stand point. What I've learned is people again want to know your style from pinterest. Are you a like minded person to themselves? When they buy from you they want to feel good about who they are supporting. Is this person is similar to themselves? Or someone who they like and can get behind them personally? Have at least 10 boards showing off your style and things you like or are interested in. Don't ONLY pin your own pins. It's important to pin things your customers will be interested in. 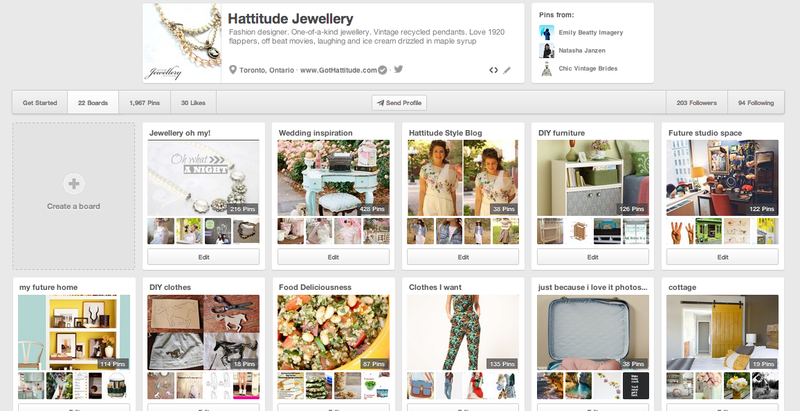 Also Pinterest is ALL visual, so make sure you are pinning photos from a photo shoot featuring your products, REALLY well captured photos for inspiration for other people is what gets the most pins I find. Remember, NO one likes a hard sell... so if you are constantly pushing your products on your customers saying, buy this, buy that...you may find your followers going down, instead of up! People don't like when you say shop, or store, or purchase, they tend to be dis-engaged so find your niche, don't hard sell. 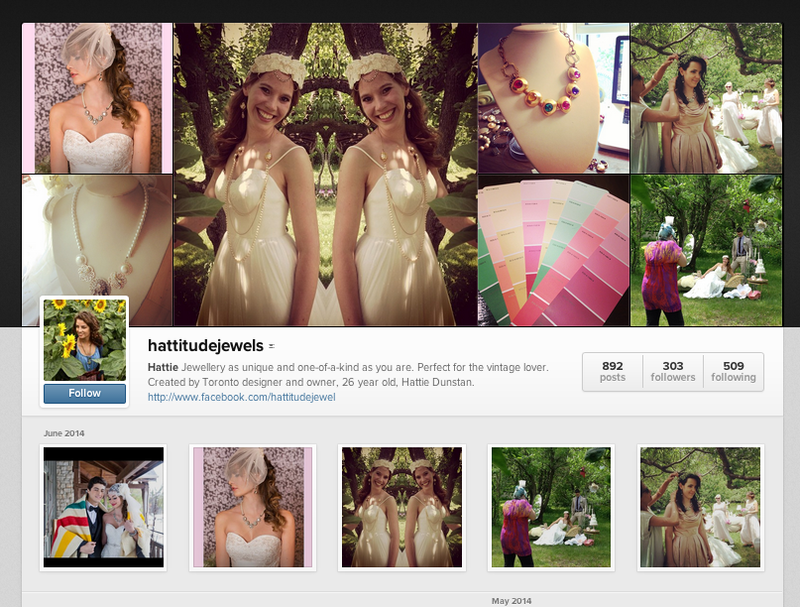 Instead soft sell with interesting topics, engaging content and pretty photos and you'll do awesome! Good luck and please let me know any tips you have for social media. I'm still trying to figure it all out as well!